We analyzed a large selection of classical musical pieces composed by Bach, Beethoven, Mozart, Schubert and Tchaikovsky, and found a surprising connection with mathematics. For each composer, we extracted the time intervals each note was played in each piece and found that the corresponding data sets are Benford distributed. Remarkably, the logarithmic distribution is not only present for the leading digits, but for all digits. In this study we generate musical chords from the oscillation frequencies of the primary component of oscillating eclipsing Algol system Y Cam. The parameters and the procedure of the musical chord generation process from the stellar oscillations are described in detail. A musical piece is also composed in appropriate scale for Y Cam A by using the generated chords from the results of the asteroseismic analysis of the stellar data. The music scores and the digital sound files are provided for both the generated chords and the musical composition. Our study shows that the further orchestral compositions can be made from the frequency analysis results of several pulsating stars by using the procedure stated in present study. You’ve heard it before. A power ballad from the 1970s or 1980s is playing and there, smack in the middle, is a face-melting guitar solo that seems to go all over the place before blowing your mind with sheer awesomeness. Think Jimi Hendrix. Think Eric Clapton. And especially think Eddie Van Halen. Unlike the piano, which can only play discrete notes, the guitar can, in the hands of someone like Sir Eddie, bend notes. It’s a quality that recalls the human voice, and it’s most likely what has made the electric guitar the go-to instrument for popular music over the past 50 years. Enter Dr. David Grimes of Oxford University. While by day he might be working out mathematical models of oxygen distribution to help improve cancer treatment, by night he, too, likes to shred on his electric guitar. So, at some point along the line, he decided to apply a little scientific rigor to the instrument he loves. “I wanted to understand what it was about these guitar techniques that allows you to manipulate pitch,” he said in an interview. You can read Grime’s paper here or, if your idea of fun does not include wading through a lot of complex equations, you can watch the brief video presentation above on his research. And below is a ridiculously sweet guitar solo from Van Halen. While you watch ponder the totally awesome physics involved. Astronomers have found cosmic clumps so dark, dense and dusty that they throw the deepest shadows ever recorded. Infrared observations from NASA’s Spitzer Space Telescope of these blackest-of-black regions paradoxically light the way to understanding how the brightest stars form. The clumps represent the darkest portions of a huge, cosmic cloud of gas and dust located about 16,000 light-years away. A new study takes advantage of the shadows cast by these clumps to measure the cloud’s structure and mass. 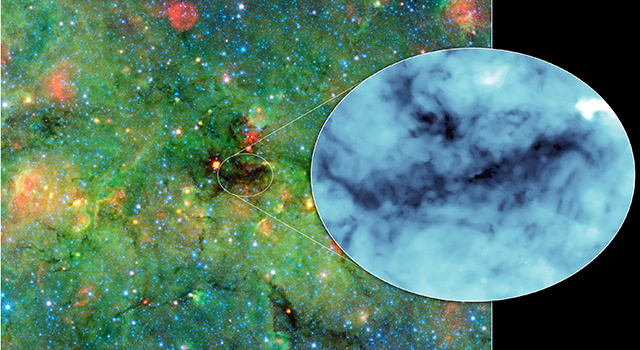 The dusty cloud, results suggest, will likely evolve into one of the most massive young clusters of stars in our galaxy. The densest clumps will blossom into the cluster’s biggest, most powerful stars, called O-type stars, the formation of which has long puzzled scientists. These hulking stars have major impacts on their local stellar environments while also helping to create the heavy elements needed for life.